If you want to discover some memorable parts of the World Heritage, Hungarian countryside is worth visiting. Come and see two unique attractions of Hungarian countryside! Let’s start our trip with the Old Village of Hollókő, which is hidden among the hills of Cserhát, in the north of Hungary. The shapes and the use of materials of the 67 traditional Palóc buildings are in perfect harmony with the natural landscape. The World Heritage site of 145 hectares includes not only family houses, a church and ruins of a medieval castle above the village, but woods and grasslands with wildlife, as well. The history of the village goes back to the 13th century, when the castle was built on Szár Hill after the Mongol invasion. After several fires over the centuries, the houses were restored to their original form, but with clay-brick walls and tiled roofs. Because of this, the buildings wouldn’t burn down again. The wooden towered, tile-covered Roman Catholic church was built in 1889, in the middle of the village. Here you can see the traditional medieval village structure, the single long street has thin lots running off it at right angles. The buildings of the village are peasant houses with stepped gable roofs and porches with wooden breast walls decorated with open-work carvings. According to the 17th century Palóc style, the interior consists of 3 distinct rooms: the cooking-dining room, the kitchen and the so-called clean room (the best decorated of the house). When the family got larger, the houses were extended lengthways. Nowadays the Palóc people, who live in the village next to the ancient one, are proud of their tradition and wear their colorful, rich-decorated folk costumes at different festivals and on Easter. 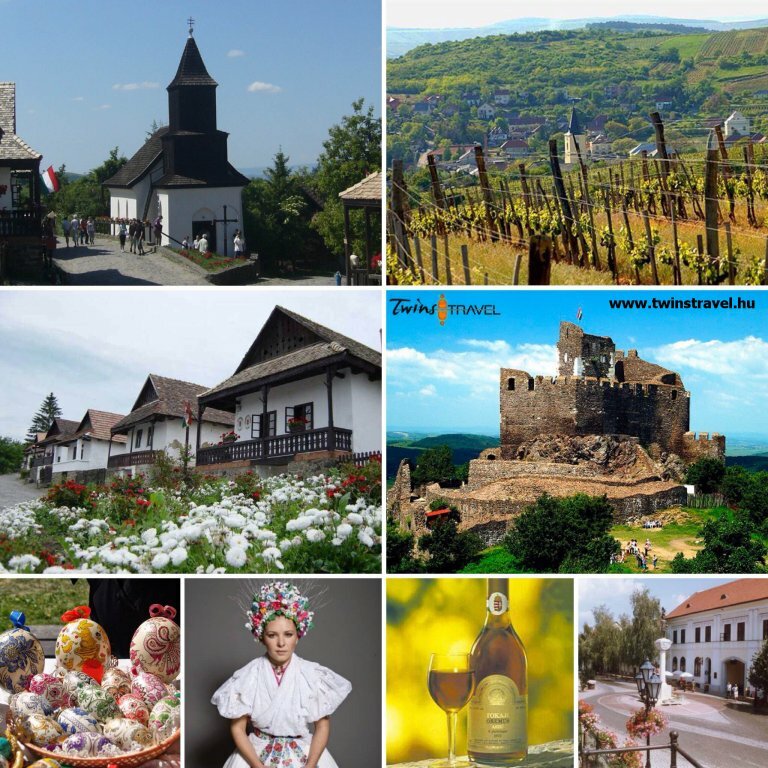 Let’s visit another part of the World Heritage, the Tokaj Wine Region. Have you ever heard about the famous Tokaji Aszú? The outstanding fame of present wine varieties goes back to the past. The wine region has been under protection since the year of 1737, when a royal decree proclaimed the area as a closed wine region, the first of its kind in the world. The leaf imprint of the indigenous plant species regarded as the common ancestor of all modern vine species, the ancient vine from the Miocene era (Vitis Tokaiensis) was found in the area. The secret of the successful wine region is probably a good “mixture” of the exceptional microclimate, the favorable soil conditions and the talent of Hungarian winemakers. The World Heritage site covers the administrative area of 27 settlements. The colorful socio-economic, cultural, ethnic, religious background of the population of the Tokaj Wine Region and the fame of the Tokaji Aszú wine have contributed to the uniqueness of the region. Come and discover the World Heritage in Hungary with us!